HTC's third take on the Incredible goes for the triple 4s: It adds 4G, Android 4.0, and Sense 4.0. The Incredible 4G LTE also fills a much-neglected spot in Verizon's smartphone lineup. 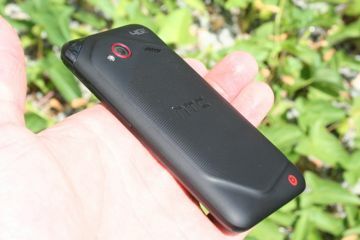 Here is Phone Scoop's full report on this compact concoction from HTC. Updated with additional signal and battery tests. HTC's venerable "Droid Incredible" line for Verizon Wireless has done very well over the last two years. Rather than sell its own variant of the excellent HTC One series, Verizon stuck to its Droid guns and instead offers the Incredible 4G LTE. This compact smartphone is more portable than today's flagship devices, but it offers many of the same features. See if small is the way to go in Phone Scoop's full review. Verizon Wireless and HTC today announced the Droid Incredible 4G LTE, a new Android 4.0 smartphone that boasts a 4-inch super LCD qHD display, 1.2 GHz dual-core Qualcomm Snapdragon S4 processor, and an 8 megapixel rear-facing camera with autofocus, LED flash, back-side illumination, and an f/2.2 and 28mm lens. The Droid Incredible 4G LTE also features a user-facing camera for video chats, mobile hotspot for up to 10 devices, and support for 32GB microSD cards.